For the 24 hours to 23:00 GMT, the USD declined 0.32% against the CAD and closed at 1.3271 on Friday. In economic news, Canada’s unemployment rate advanced to 5.8% in January, compared to a rate of 5.6% in the previous month. Markets had envisaged was for the unemployment rate to rise to 5.7%. Moreover, the nation’s seasonally adjusted housing starts declined to a level of 208.0K in January, compared to a revised reading of 213.6K in the prior month. Market participants expected housing starts to fall to a level of 205.0K. In the Asian session, at GMT0400, the pair is trading at 1.3287, with the USD trading 0.12% higher against the CAD from Friday’s close. 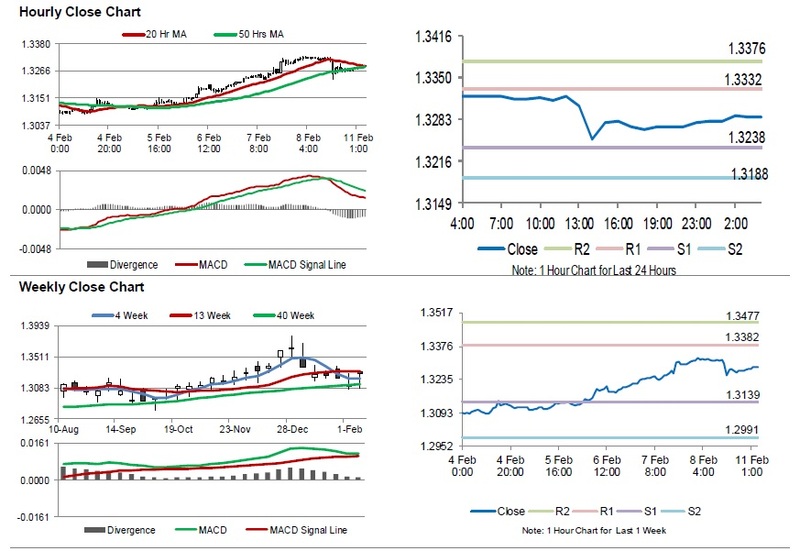 The pair is expected to find support at 1.3238, and a fall through could take it to the next support level of 1.3188. The pair is expected to find its first resistance at 1.3332, and a rise through could take it to the next resistance level of 1.3376.